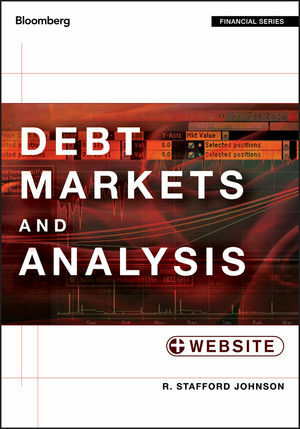 Debt Markets and Analysis provides professionals and finance students alike with an exposition on debt that will take them from the basic concepts, strategies, and fundamentals to a more detailed understanding of advanced approaches and models. Engaging and informative, Debt Markets and Analysis provides practical guidance to excelling at this difficult endeavor. R. STAFFORD JOHNSON is Professor of Finance at the Williams College of Business, Xavier University. He is the coauthor of Options and Futures, and author of Introduction to Derivatives as well as the first two editions of Bond Evaluation, Selection, and Management. Debt Markets and Analysis is the first of three books in a series: upcoming are Derivatives, and Equity Markets and Portfolio Analysis. Johnson has written many articles appearing in journals such as Applied Economics, Journal of Financial Education, International Review of Economics and Business, Journal of Economics, the Financial Review, and the Review of Quantitative Finance and Accounting.